Baltimore, MD – A joint venture organized by Alex. Brown Realty, Inc. (ABR), Wakefield Capital and Affinity Living Group has announced development plans for a 120,000 sf senior housing facility on James Island in Charleston, South Carolina. The Class A facility is scheduled for completion in June 2018. ABR Chesapeake Fund V, a real estate fund sponsored by ABR, invested approximately $10.1 million in the venture. Financing for the project is being provided by BBVA Compass. 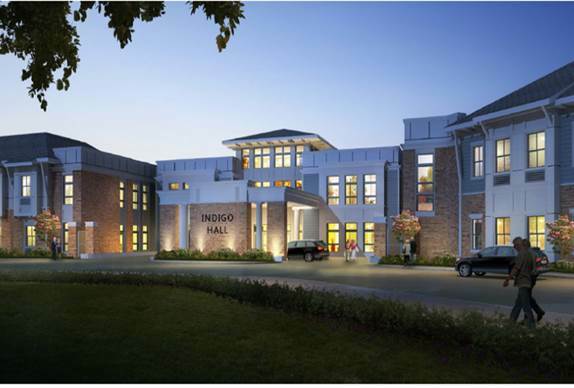 Designed as a best-in-class community, Indigo Hall will offer 116 assisted living units and 40 memory care units as well as first-class amenities and abundant community spaces. The property will accommodate both rehabilitation and therapy services. “There is unmet demand for Class A senior facilities in the Charleston area,” commented Charles Trefzger, CEO of Affinity Living Group. “Indigo Hall will meet that demand. It will be a beautiful community offering quality services and amenities to residents,” added Trefzger. Planned amenities include a bistro, movie theatre, library, gym and much more. Affinity and Wakefield are experienced developers, owners and operators of senior housing properties. “Affinity’s leading-edge approach to facility management and Wakefield’s extensive track record is impressive,” commented John Prugh, president and CEO of ABR. “We look forward to working with them to create a successful investment for our partners.” The transaction represents the first joint venture between an ABR-sponsored investment program and Wakefield/Affinity.